I am always looking for new Christmas books to add to our collection, and I have one to share with you today! 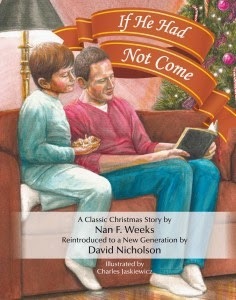 If He Had Not Come was originally written by Nan F. Weeks, and is now being presented to a new generation by David Nicholson. The story was originally published in 1938, but David Nicholson discovered this story when his own children were young, and reading it yearly, decided he wanted wanted to keep it alive for a new generation. His work with illustrator Charles Jaskiewicz brings us this poignant and beautiful children's book. The story line is a familiar concept. I think we've all read books or seen movies where a character learns what the world would be like if they had never existed. This book is similar, except we discover what the world might be like if it was Jesus that had never come to Earth. The story centers around a boy named Bobby, who fell asleep on Christmas Eve thinking about the family's Bible reading, the verse John 15:22 and the words "If I had not come." Bobby wakes up on Christmas morning, excited, as most children are. Except nothing is right. There are no Christmas decorations, no special breakfast, all the stores are open on Christmas day, but there are no churches, hospitals, or homeless shelters. . . and nobody even knows what the word Christmas means! As Bobby is confused and searching for answers, he keeps seeing the words IF I HAD NOT COME all around him. This story itself is simple. It helps kids understand the impact of Jesus, not so much in our personal lives, but in the world in which we live. It is a fantastic tool for opening up discussion with the kids! At the end of the book are several resources, and that is where there is more depth, particularly regarding personal decisions. It starts with a set of questions for families/teachers to discuss with children that are based on the actual story. There are no "right" or "wrong" answers, but rather they are intended to help open up dialogue and discussion. The Going Deeper section is an area where families or classes can explore the concept of what would have happened without Jesus, and Biblical references to read about why Jesus did come to earth. Then there's a section with The Gospel Message following an A-B-C method, as well as an idea for an artsy/hands-on activity for children. I'm personally saving that activity for when we re-read the book again closer to Christmas. There's also a note that a script for stage plays is coming soon, and that sounds so fun! The beautiful hardback version that I received is available for $18.95, or you can get the e-book version for only $3.99. It is geared for children ages 6 years old and up, but it is truly a family book. There's a lot to be said about a picture book that will find its place in the annual book basket, because it can be read year after year. This is sure to be one of those books in our family! You can read find out more about David Nicholson and the book on the website, or on Facebook. Of course you can always read more reviews as well!